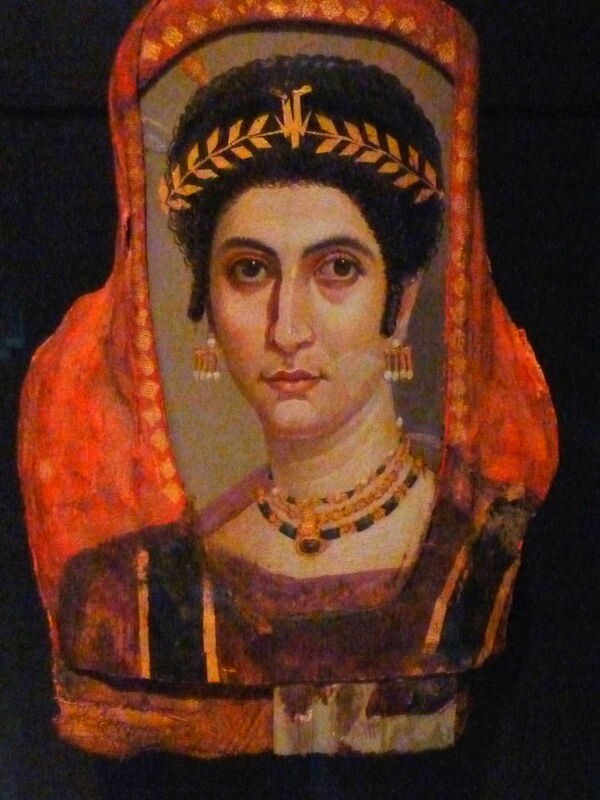 Anonymous, Funerary Portrait of a Woman 'The European' (c 80 - 200 CE), encaustic on cedar panel, 42 x 24 cm, Musée du Louvre, Paris. By dalbera from Paris, France, via Wikimedia Commons. In the distant past, fresco painting was all very good when you wanted to brighten up the walls or ceiling of a substantial building, and could afford to pay an artist handsomely for their labour. But there was also demand for smaller, more portable works of art. Some would have been painted onto animal skins, and ultimately were developed into miniatures in beautiful manuscripts, which used the precursors of watercolours. One alternative medium developed most successfully, though, was wax, in encaustic painting. The characteristic feature of encaustic painting is its use of a binder which in most ambient temperatures is solid, but becomes liquid paint at higher temperatures, usually no higher than the boiling point of water. This enables the painter to heat mixtures of pigment and binder which are kept typically at around 50˚-90˚C (120˚-200˚F), apply them while still hot, and for them to bind the pigment to its ground once the paint cools. People started to keep bees by around 7000 BCE, and one of their most important products has been the wax from which they build their hives. Beeswax has a typical melting point of about 63˚C (145˚F), a temperature readily achieved by heating water but well above daytime maximum air temperatures experienced where people live, which very seldom reach 50˚C (120˚F). Beeswax was therefore most probably the first binder used for encaustic painting, and remains the most common substance used in its paints today. Other resins have also been used to make solidified paint harder and more resistant to damage. The major modern manufacturer of encaustic paints, R&F, now adds small amounts of damar resin, a powdery gum tapped from species of trees which grow naturally in India and South Asia. Dammar resin is also widely used in varnishes. Encaustic paint is thus unusual as it doesn’t rely on a chemical process to form the dry paint layer, but a physical change of state, which is fully reversible. Common supports include panels of wood, which probably didn’t have any ground applied originally. 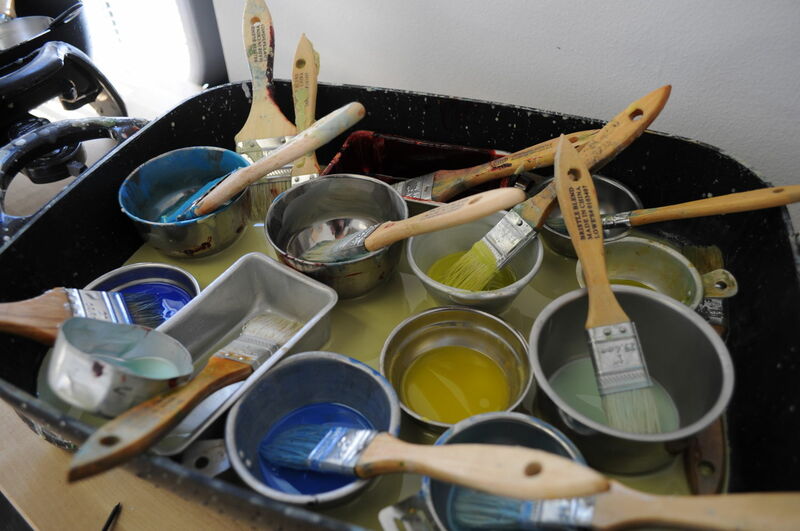 More recently grounds of gesso have been used successfully, but encaustic paints have been applied to a wide range of supports including dried and fired clay tablets, pots, and sculpture. Joe Mabel (contemporary), Materials for encaustic painting, artist Alicia Tormey’s studio at INSCAPE, Seattle (2010), photograph, further details not known. Image by Joe Mabel, via Wikimedia Commons. This photo by Joe Mabel shows the materials used by the encaustic painter Alicia Tormey in her studio in Seattle a few years ago. One significant limitation with the process of painting using encaustic media is that heated paint tends to be thin and runny. Most artists therefore apply their paint with the support laid flat, and leave their work horizontal until the paint has solidified. Instead of painting stood up in front of an easel, they tend to work lying down. 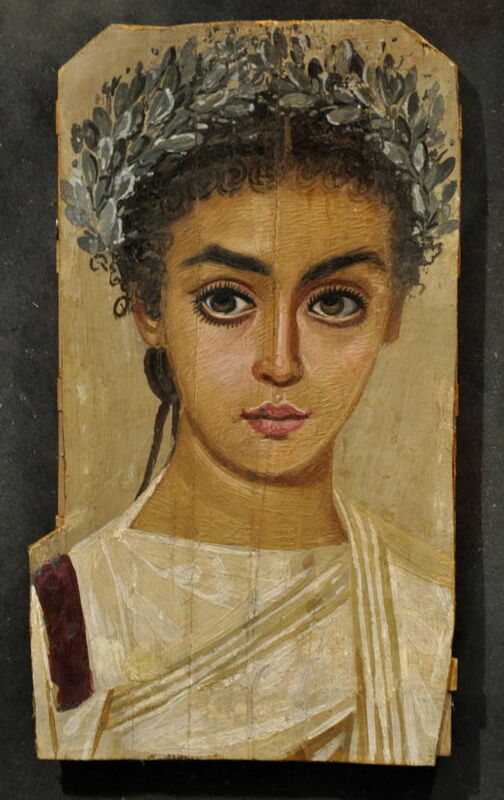 Although encaustic paintings are susceptible to physical damage and decay, some from before the Christian era have survived, and it’s thought that the medium was used for several hundred or even thousands of years before the birth of Christ. 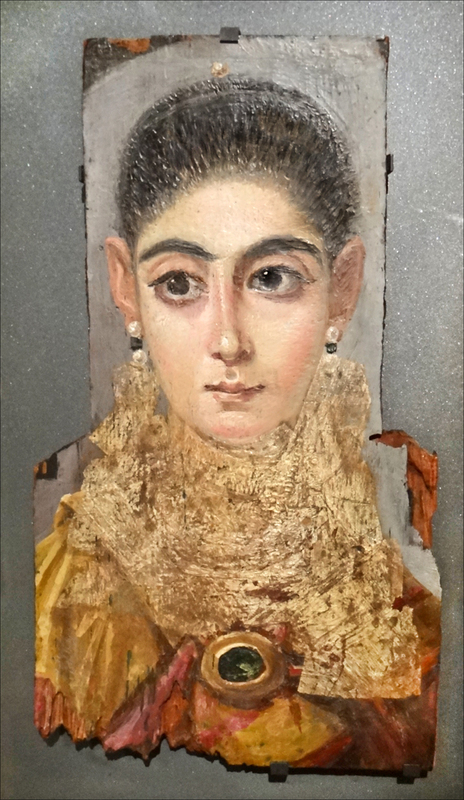 The best-known early encaustic paintings are those made by colonists from Greece and Rome when living in Egypt between about 80-250 CE – particularly those found in the Fayum (or Faiyum) Basin. These were first discovered in about 1615, with most being removed during the nineteenth century and spread across collections in Europe and America. These funerary portraits are some of the most haunting images in European art, and demonstrate how skilled encaustic painting can rival other media. It can achieve a remarkable lucency, although this depends on the processing of the beeswax and its ageing. A tradition of encaustic painting also grew up in early Christian communities, where it was used to create icons for places of worship and the homes of the wealthiest. 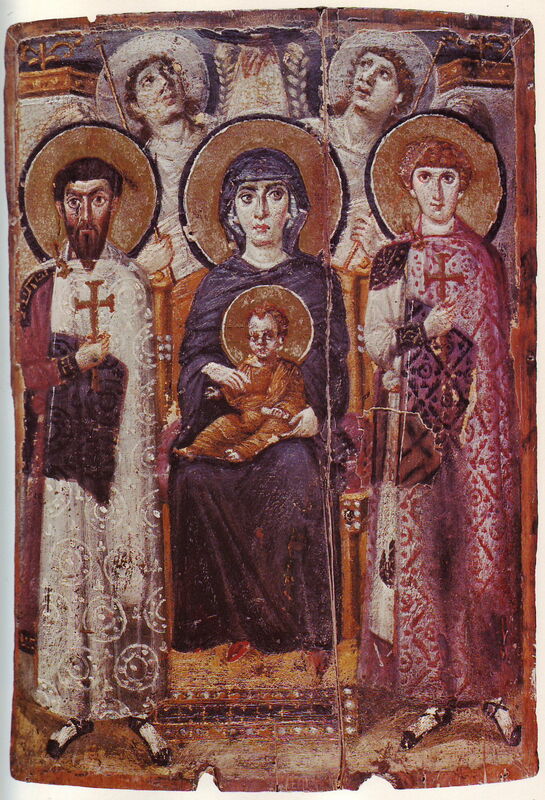 Artist not known, Virgin Mary and Child with Saints Theodor of Amasea and George, and Angels (c 580 CE), encaustic, 68.5 x 49.7 cm, Saint Catherine’s Monastery, Sinai, Egypt. Wikimedia Commons. This encaustic painting of the Virgin Mary and Child with Saints Theodor of Amasea and George, and Angels was made in about 580 CE for Saint Catherine’s Monastery in Sinai, not too far from the Fayum portraits. 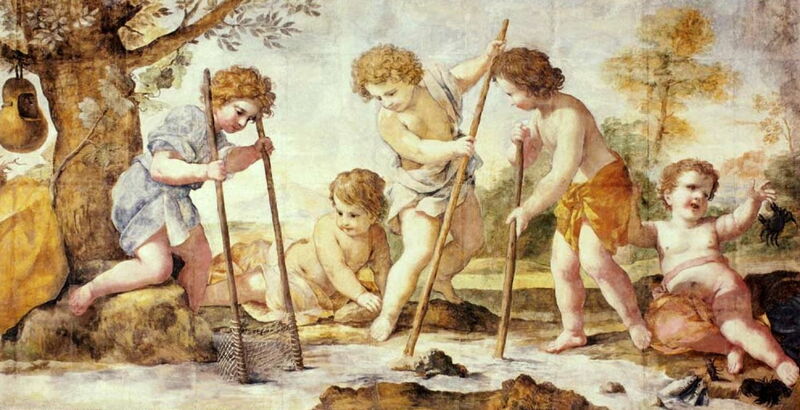 Giovanni Francesco Romanelli (1610–1662), Boys Fishing (c 1640), encaustic on cardboard, 159 x 310 cm, Casa Museu Eva Klabin, Rio de Janeiro, Brazil. Wikimedia Commons. A few artists continued to paint in encaustic even after the Renaissance, although this has remained very much a minority pursuit. Giovanni Francesco Romanelli’s painting of Boys Fishing from about 1640 curiously uses cardboard as its support, suggesting that it may have been more of an experiment. 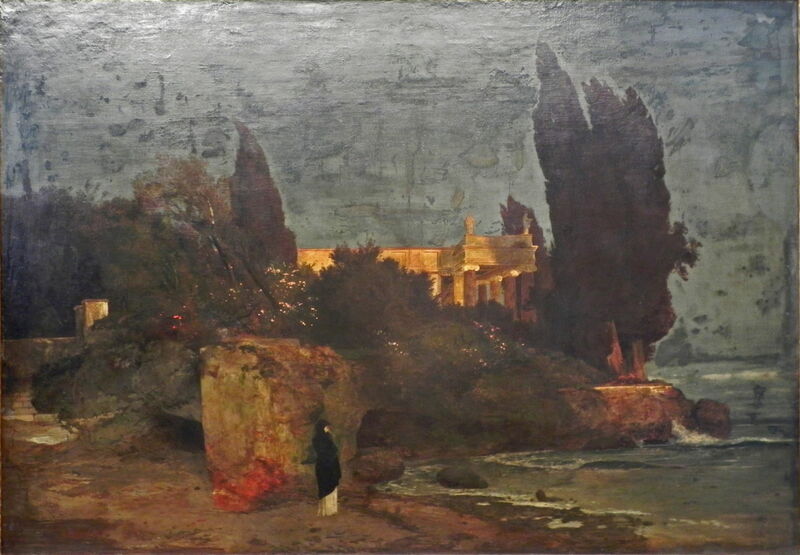 Arnold Böcklin (1827–1901), Villa by the Sea, version I (1864), resin and wax on canvas, 124.5 × 174.5 cm, Sammlung Schack, Bayerische Staatsgemäldesammlungen, Munich, Germany. Wikimedia Commons. The nineteenth century saw a resurgence in the use of more traditional media such as egg tempera. In addition to painting with that, some like Arnold Böcklin returned to try encaustics, here in one of his major works, the first version of Villa by the Sea from 1864. More followed suit in the twentieth century, including James Ensor, Diego Rivera and Jasper Johns, and today encaustic methods have a small but very enthusiastic following. Posted in General, Life, Painting, Technology and tagged Böcklin, encaustic, history of painting, painting, Romanelli, Tormey, wax. Bookmark the permalink.